Oct 10 – From one corner of the country to another – Trees & Flowers & Birds! Trees & Flowers & Birds! Musings of an adventurous empty nest mom on everything under the sun. Well, since I am writing this while taking a lunch break at my desk, as my eyes wandered off my screen, the first thing I saw just above was this calendar. So let me tell you about that calendar. 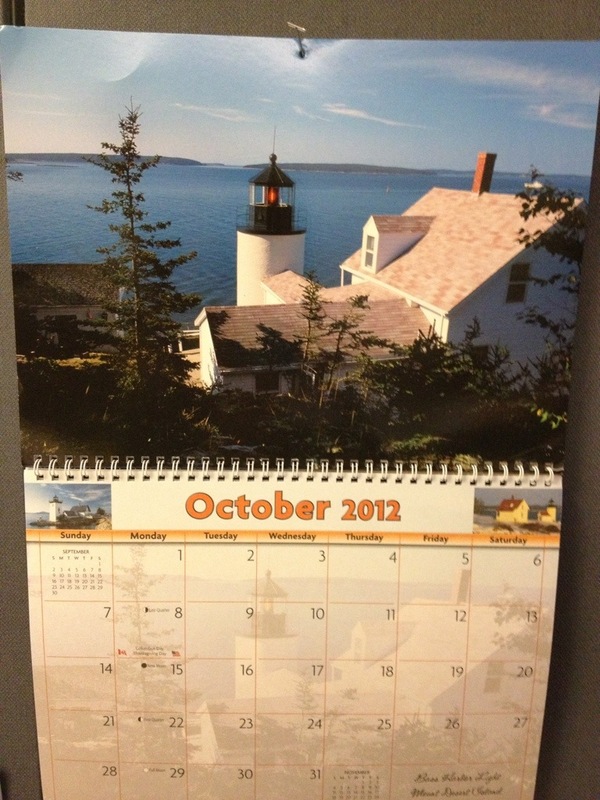 It is of Maine lighthouses. This is my…5th or 6th version of this calendar I think? It’s an interesting tale how the state over the upper right corner of the country has become the place I would most want to spend a summer or any extended time visiting. Can’t get much further away from my left coast corner can it? As it happens when I joined the two online groups where I’ve met most of my friends, that he people who happen to live in Portland, Maine perhaps are the most kindred of kindred spirits to me. That is enhanced by the fact that both times I have visited Maine, I loved every moment. Do I love the people that much more because of where they live? Do I love where they live that much more because they are there? Probably a little of both. But, we all pretty much had to roll the dice. I honestly don’t remember what drew me to Maine Mom. I am pretty sure it was I who approached her about it. (She probably remembers better than I do!). All I know for sure is that once we finally met in Seattle the deal was set in place for all future gatherings. If we gather anywhere near each other’s city, we extend the visit to hang out at our homes. She took me to see a couple of the Maine lighthouses that are near her so every time I turn the calendar to the ones I know I feel an extra warm glow. Then there’s the Cheers & Jeers boys. From the Daily Kos blog community which drew me to attend the Netroots Nation events. Bill and Michael are who I spend probably the most time with when we all attend. The first time I met them was in Portland Maine. Towards the end of an August Mom’s gathering I had put the word out to the New England C&J group that I was visiting and they threw a little luncheon together. That first hug from Michael? Well, you just don’t forget those! I’m telling you, one of these years I will spend a summer in Maine and just BE with Maine Mom & her family and Bill & Michael. I *need* to do that. The calendar comes from Michael every year. It started as a part of a Secret Santa gift exchange and he’d thrown one in for me for fun. He’s asked me every year if I still want to get one. Oh, yes, I sure do! I mean, it is lovely to have all of these fantastic friends, but when you are all so damn far away and I am lucky IF I get to see you once a year? Or not, as this year has turned out. At least let me be able to look up and see the place you live, think of you all, smile and go about my day. Oct 11 – I do believe it is finally Fall! I love Ebates – if you shop online you will too!